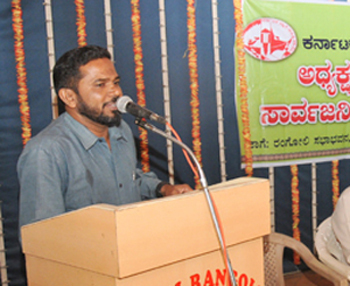 Mangaluru, April 4, 2015: Interacting with media, Karnataka Beary Sahitya Academy President B A Mohammed Haneef said regarding the caste census by the State government on April 11, the surveyors should register Muslim sub-castes or communities and not the religious groups like Sunni, Shia, Jamate etc. He also said that there are no castes in Muslims, but there are several communities like Beary, Meman, Dakhani, Navayat etc. In community description of the commission, the Beary and Navayat have been mentioned twice as Beary, Beary Muslim and Navayat , Navayat Muslim. In the circumsatnces, Muslims should mention their religion as Islam, caste as Muslim, community as Beary, Meman or Dakhani and their mother tongue. As there is confusion in community description, it is better to write the information than marking, he said. Meanwhile, Mohammed Haneef said that Muslims are not getting four per cent reservation in local body election, as they are added in 2A group with other castes. Under OBC reservation policy of the Central government, except nine rich Muslim communities, all other Muslims have been added under ’other Muslims’ category.